Spacious 2 bedroom apartment with 4 single beds located in the centre of Ayia Napa just a short walk from a number of beaches. This spacious 2 bedroom apartment is located near the centre of Ayia Napa. The location is ideal for family holidays and is within walking distance to bars, taverns and supermarkets and just a stones throw to various sandy beaches. On entering the apartment you will be presented with spacious open plan living and dining areas with a kitchen. The kitchen has all modern features and comprises of a breakfast bar, electric hob, counter top oven and fridge freezer. The living area has a two sofas that can be used as extra beds and an entertainment area comprising of a flat screen TV and satellite TV. From the living area, the patio door leads out onto the balcony which is shared with a twin bedroom. There are a total of two bedroom in the apartment, the first being a twin bedroom with a small balcony and another twin bedroom with windows. These 2 bedrooms share a spacious family shower room with WC. The apartment is fully air conditioned throughout with an air conditioning unit in each bedroom and one in the living room area. We can provide any baby or mobility items, available on request at an extra charge. Available also is a safety deposit box for your valuables, hairdryer, iron and ironing board. A free wireless internet connection is also provided. At the side of the apartment is a large car park area. We really do have the best beaches on this side of the island and you are close to quite a few, namely Katsarka Beach (750m), Liminaki Beach (1.3km) and the world famous Nissi Beach (2.7km). The other popular beaches of Fig Tree Bay, Konnos Bay and Makronissos are just a short car journey. Ayia Napa boasts many attractions to visit. For the thrill seekers we have an awesome water park called WaterWorld, just a 10 minute drive (or take the bus). Nearby, we also have attraction such as the Ayia Napa Monastery, Ayia Napa Harbour, Thalassa Museum, Sculpture Park, Love Lock Bridge, Sea Caves, Fun Park, Cyclops Cave and so much more. Larnaca Airport is the closet and most popular airport and is just a 25 minutes drive. Taxi transfers can be arranged for those that are not hiring a car. 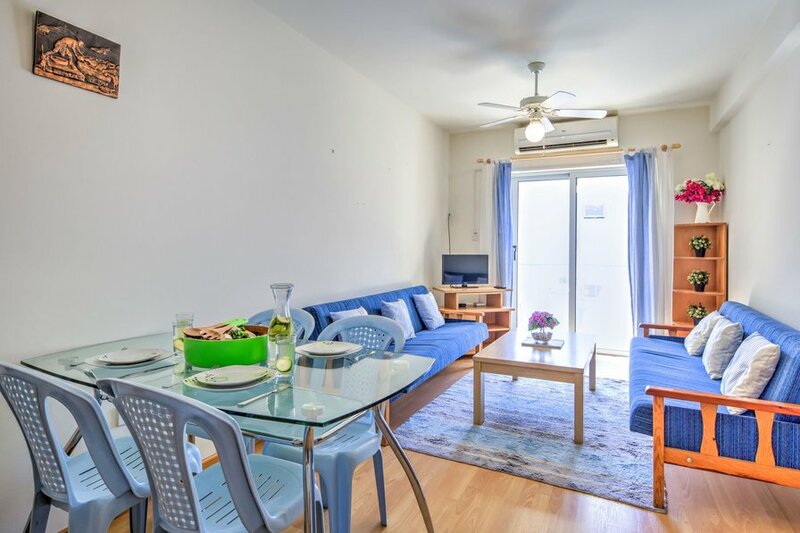 The apartment is situated close to a popular bus route, one way taking you all the way to Paralimni and the other way to Ayia Thekla, with stops at other resorts such as Kapparis, Pernera, Konnos Bay, Cape Grecko and Protaras. There is a large selection of bars and restaurants within a short walk but for more sedate night out, Protaras is only a 15 minute drive or take the bus directly. Our apartment is very popular with wedding guests who are attending weddings at the nearby Nissi Park, Adams Beach, Grcian Sands, Olympic Lagoon and Dome hotels, all accessible by bus or just a short drive.